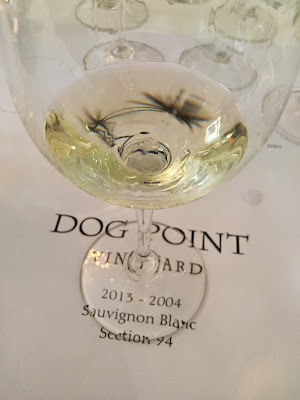 Wine tasting becomes that much more special when there’s emotion involved – and there was a helluva lot of soul-baring at the recent Decade of Dog Point celebration. Much of the emotive energy came because it was the first time ever the Dog Point team had tasted every wine they’d ever made, with absolutely no one quite sure how the wines would taste. Even Ivan and James, the winery co-founders, looked fidgety about opening up their winemaking back catalogue. 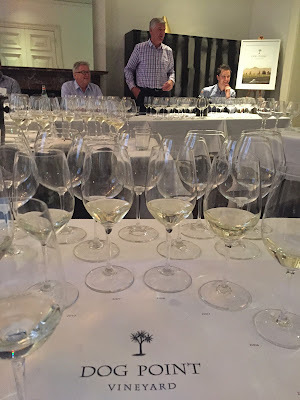 But they needn’t have worried – all this tasting illustrated was just how drinkable (and regularly bloody exciting) even the older ‘standard’ Sauvignon Blancs were. Part of the secret to this label’s success is the Dog Point Vineyard itself, which is one of the oldest privately owned vineyards in Marlborough. Planted by Ivan and Margaret Sutherland back in the late 1970s, it remains not only the backbone of the Dog Point label but also a key source of fruit for a whole swathe of premium Marlborough producers. It wasn’t until the 1990s that Ivan met James Healy, however, with the pair working at Cloudy Bay alongside Kevin Judd (Ivan in viticulture, James in winemaking) during a period when Cloudy Bay really put quality Marlborough wine (and particularly Sauvignon Blanc) on the map. In 2002 Ivan and James finally decided to split from Cloudy Bay to start their own label, with Ivan providing fruit and James making the wine in one of those classic wine partnerships. As a final twist of irony, Kevin also left Cloudy Bay in 2009 to start his own Greywacke label, also buying fruit from Ivan and in fact moving into the Dog Point winery too (Tim White cheekily calls it the ‘Cloudy Bay retirement village’). Needless to say with such a combination of winemaking skill and high quality fruit, no one should be surprised that the Dog Point wines are so good – and good from the very first vintage (as you’ll see below). 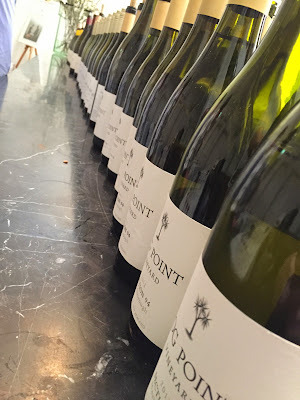 Speaking of vintages, there are 2002 and 2003 Dog Point Vineyard wines in existence, but given that they were made at Cloudy Bay, the decision was made to not put them in this lineup. The following wines were thus tasted in a large, slightly rushed session in Melbourne recently. While all of the wines were checked initially for cork problems, the spectre of TCA claimed more than one scalp during the day, much to the chagrin of Ivan and James who then had to fence off the questions from an audience unconvinced by the continued decision to seal the Dog Point ‘barrel wines’ with a piece of bark. Notes are as written on the day, Background information in italics. 2013: Very even vintage. Normal year in many ways. Moderate yields. 2010: Stop start vintage with a quite late dry summer. 2009: Warm and humid. Some disease risks but otherwise good. 2007: Average flowering. Warm year and good quality. 2006: Superb year. Earliest harvest on record. 2005: Very average flowering and fruit set. High disease risk over warm summer. 2004: Frosts. Average to cool summer but warm autumn. Low yields. Making up 60% of the Dog Point production, this is undoubtedly an important wine. The fruit for this initially just came from the original Dog Point ‘Estate’ Vineyard but now comes from eight different plantings in the Lower Brancott, Renwick, Fairhall, Omaka and Rapaura subregions in the Wairau Valley, with all this fruit under Dog Point control. The UCD1 clone is planted exclusively and is cropped at an average of 7.5t/ha. At harvest, all fruit is hand-picked, transported to the winery in small bins where it is whole bunch pressed, chilled and cold settled for a minimum 48 hours before fermentation, with 20% allowed to ferment naturally. The wine is then kept on lees for 2-3 months and bottled later in the year. Wild ferments were only introduced in 2006 and increased gradually to 20% from 2011 onwards. Some issues with this wild ferment meant a few vintages there with closer to 5g/l residual sugar in that period. All wines in the lineup were under screwcap. pH 3.11, TA 6.9g/l, RS 2.9g/L. 13.5% alc. pH 3.17, TA 7.2g/L, RS 2.6g/L. 13.5% alc. pH 3.15, TA 7.2g/L, RS 3.3g/L 13.5% alc. pH 3.16, TA 7.8g/L, RS 3.2g/L, 13.5% alc. pH 3.16, TA 7.5g/L, RS 4.9g/L, 13.5% alc. pH 3.13, TA 6.7g/L, RS 4.8g/L, 13% alc. pH 3.14, TA 6.6g/L, RS 2.6g/L, 13.5% alc. pH 3.14, TA 7.1g/L, RS 6g/L, 13.5% alc. pH 3.17, TA 8.5g/L, RS 3g/L, 13% alc. pH 3.17, TA 8g/L, RS 5g/L, 13.5% alc. Sourced from a block in the original Dog Point vineyard, which is cropped at 7.5t/ha (50hl/ha), the fruit handpicked and whole bunch pressed into older French oak barrels. Indigenous ferment is long and slow with occasional battonage to ‘retain freshness’. No malo, the wine is racked from barrel to tank and bottled unfined after a light filtration only. Released the following year, approximately two years after harvest. This wine, as with all the ‘oaked’ Dog Point wines, is bottled under cork. When pressed, James explains that ‘we just use cork because we’re old fashioned‘. This came over in a suitcase as its an unreleased bottling sample. Released in 2015. Very much a work in progress. Showing a little sulphur on the nose and just bottled. Indeed the palate is still bound up in itself and cheesy. A work in progress. N/R. pH 3.21, TA 7.6g/l, RS 1.7g/L, 13.5% alc. pH 3.2, TA 7.2g/L, RS 1.5g/L, 14% alc. pH 3.12, TA 7.9g/L, RS 1.6g/L, 14% alc. pH 3.24, TA 7.8g/L, RS 3.4g/L, 14% alc. Honeyed and looks quite dark. Recognisable as an oaked Sauv though, with a little passionfruit to give it away, the palate is quite fruity but looks rather more textured than the wines before it. Good but not the absolute drive. Quite conventional. 17.5/20, 91/100(These three tasted quite quickly). pH 3.17, TA 7.4g/L, RS 5.9g/L, 13.5% alc. pH 3.32, TA 7.7g/L, RS 3.3g/L, 13.5% alc. pH 3.15, TA 7.2g/L, RS 2.5g/L, 13% alc. Also sourced from the Dog Point ‘home’ vineyard, using a blend of two clones – 65% Mendoza and 35% B95. The Mendoza ‘tends to be higher in acidity and confers strong citrus character’, while the B95 has ‘softer acid and contributes subtle meaty and mealy characters’. Vineyard is cropped at 5 t/ha (30hl/ha), with all fruit handpicked and whole bunch pressed to French oak (15% new) and wild ferment and full malo. Small amount of battonage, then bottled without fining and a light filtration. Interesting looking at these in a lineup – a real consistent nose of oatmeal and vanilla bean with increasing dollops of honey as it ages. From 2004 the new oak was 25%, all heavy toast, reduced to 15% from 2008. Notably all new oak is heavy toast as James believes ‘heavy toast oak with grapefruity flavours is a winner’. Just bottled and looked it. pH 3.28, TA 7.3g/L, RS 0.6g/L, 14% alc. pH 3.25, TA 7g/L, RS 0.8g/L, 14% alc. pH 3.27, TA 7g/L, RS 1.0g/L, 14% alc. ‘This looks a bit oaky looking at it now’ according to James. pH 3.34, TA 6.8g/L, RS 1.9g/L, 14% alc. pH 3.26, TA 8.3g/L, RS 1.7g/L, 14.5% alc. pH 3.32, TA 7.1g/L, RS 1.7g/L, 14% alc. pH 3.30, TA 6.6g/L, RS 1.3g/L, 14% alc. pH 3.40, TA 7g/L, RS 4.8g/L, 14% alc. pH 3.37, TA 7.1g/L, RS 2.6g/L, 14% alc. Produced from six Pinot clones (B777, B667, B115, Pommard Clone 5, Abel and AM10/5) planted in the clay soils on the gentle slopes and plots around the winery. Small parcels of fruit included in 2013 from the new Dog Point Yarrum and Omaka Settlement vineyards. Average cropping is 5 t/ha. Fruit is handpicked, spends a night in the chiller in picking bins before being put through the sorting table and destemmed (small amount of whole bunches) then transferred to small open fermenters via gravity. After a cold soak fermentation is wild with twice daily manual punching down. 21-28 days of skin contact and 17 months in barrel. Bottled without fining or filtration. Like the white wines oak has been reduced here, from 50% back to 40% in 2010 onwards and toast reduced in accordance. More Dijon clone influence from 2006 onwards and whole bunches increased to 10% from 2010.
pH 3.65, TA 5.2g/L, RS 0.3g/L, 14% alc. pH 3.56, TA 5.4g/L, RS 0.2g/L, 14% alc. pH 3.58, TA 5.4g/L, RS 0.3g/L, 14% alc. pH 3.72, TA 5.3g/L, RS 0.2g/L, 14% alc. pH 3.69, TA 5.9g/L, RS 0.4g/L, 14% alc. pH 3.69, TA 5.5g/L, RS 0.0g/L, 13.5% alc. pH 3.64, TA 5.5g/L, RS 0.0g/L, 13.5% alc.Creamy oak. This is a much more complete effort, the red fruit not banging into extraction. Softly softly. Quite lithe even. Really quite delicious. 18/20, 93/100(These last two were looked at very quickly). pH 3.55, TA 5.7g/L, RS 0.0g/L, 14% alc. pH 3.55, TA 5.9g/L, RS 1.0g/L, 14% alc.